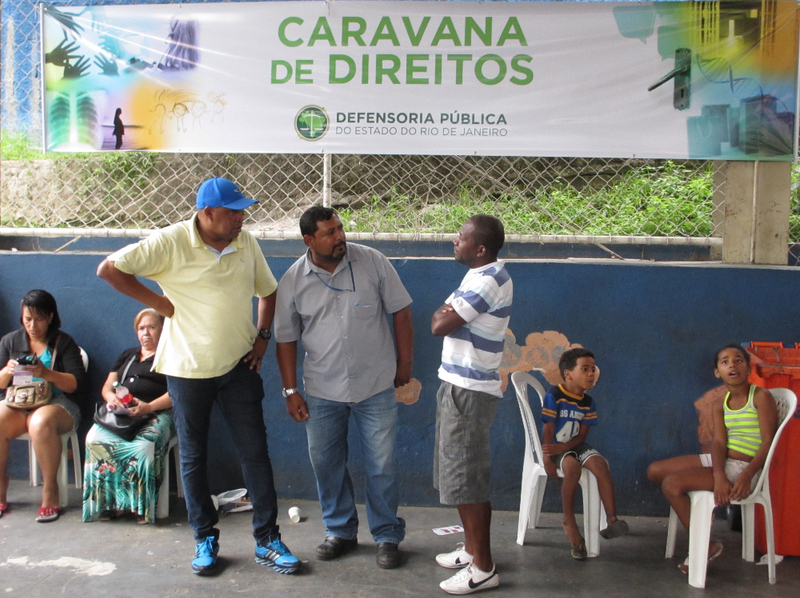 Victims of the City government’s broken promises of housing in Complexo do Alemão spoke out at an event held in the community by Rio de Janeiro’s Public Defender’s Office on Saturday May 23. 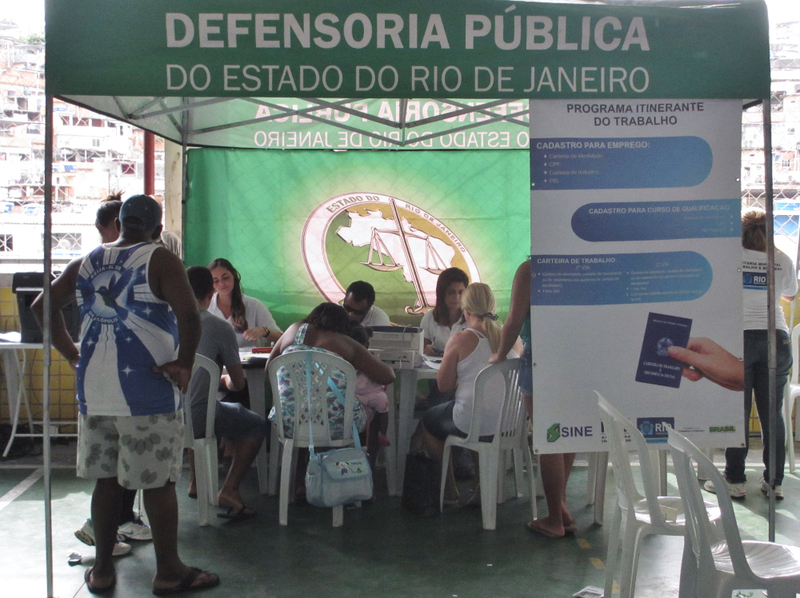 The Public Defender’s Office exists to guarantee access to legal assistance for all Brazilians, a right enshrined in the constitution. It launched its “Caravan of Rights” campaign in a community sports center on the weekend. Residents were able to talk to public defenders about their rights and had access to a range of services, from printing identity documents to accessing information on jobs and training. 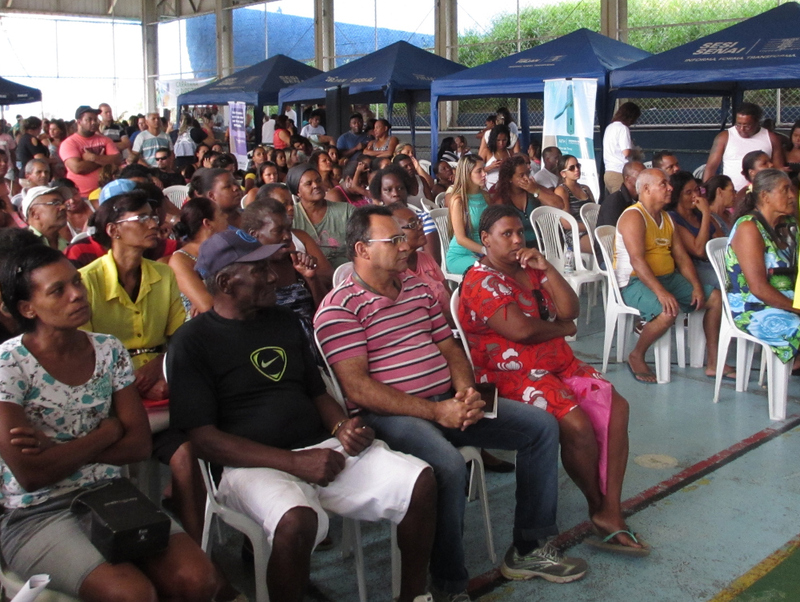 The event was a chance for ex-residents of a community in Alemão that was removed by the City government to speak about their plight in front of an audience of several hundred. The discussion was led by Joaquim Neto, President of the National Association of Public Defenders. 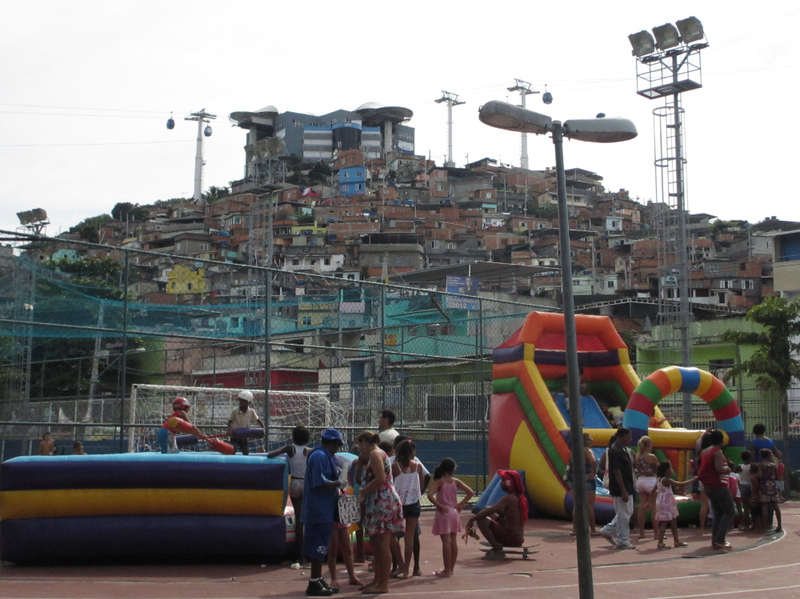 Ex-residents of the community known as Favela da Skol, named after the Skol beer factory once located there, described their desire for new housing on the site of their old homes—a promise made to them by then Vice-Governor (now Governor) Luiz Pezão. Approximately 500 families had occupied the land for over a decade when they were removed between 2009 and 2011, on the grounds that the houses were in an area of risk. They were represented by Regina Dantas, President of the Skol Residents’ Association. She described the uncertainty the removed families feel, unsure if the rent assistance provided by the government will be taken away and if they will ever return, especially now that Skol has been cited as a potential location for a long-awaited university in Complexo do Alemão. Dantas’ testimony was echoed by that of ex-resident Camila Santos, who explained the seriousness of the situation. “No one chooses to live in an area of risk,” she said. “They do so out of extreme need.” Many of the families, already living in vulnerable conditions before being evicted, have been struggling to get by with a small amount of social rent provided by the government, at a value that has not been increased in years. Santos said that Governor Pezão promised new houses in nine months, but the community is still waiting five years on. 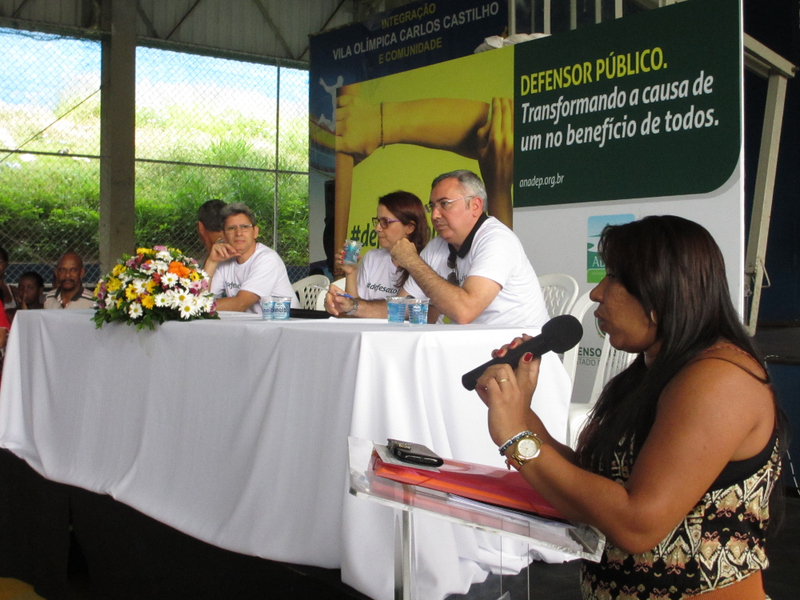 The public audience was one part of a day of activities coordinated by the Public Defender’s Office. 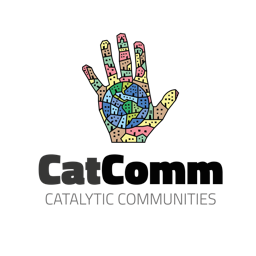 It was the result of several meetings held with community leaders who make up the Juntos Pelo Complexo do Alemão (Together for Alemão) collective to identify areas of need related to rights and services. As a result, residents who came to the open event in the sports center could meet with various officials and service providers, to discuss legal assistance, rights and information on health and employment, among others. 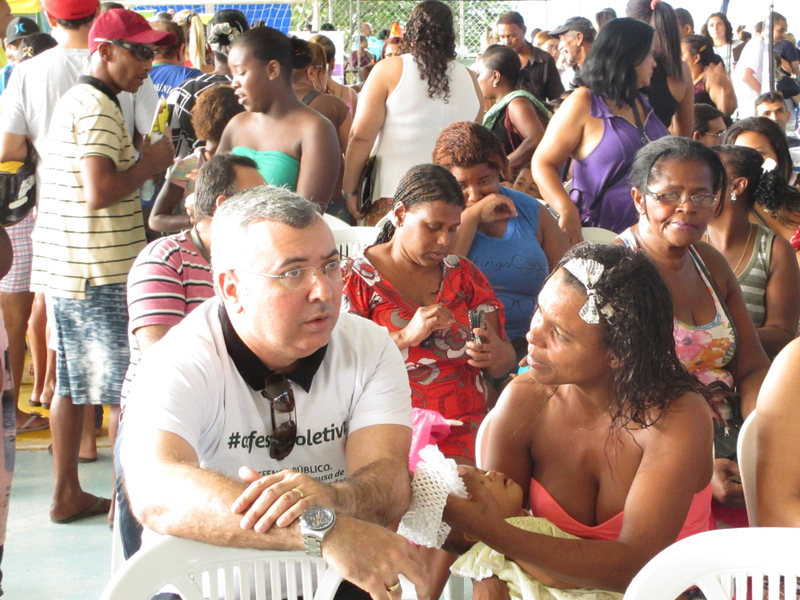 Alan Brum from the community organization Raízes em Movimento and Lúcia Cabral, who runs educational charity Educap, both widely respected organizations in Complexo do Alemão, took part in the meetings with the Public Defenders’ Office in the run-up to the launch of the Caravan of Rights campaign. 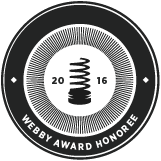 This article was written by Sarah Jacobs, and published on June 2, 2015.